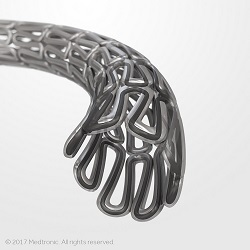 Medtronic has secured approval from the US Food and Drug Administration (FDA) for its Resolute Onyx drug-eluting stent (DES). Resolute Onyx, which has been launched in the US, is claimed to be the only DES to feature Core Wire technology. The method includes the establishment of a single strand of cobalt alloy wire into a sinusoidal wave to construct a stent.. The Core wire technology will help to integrate radiopaque inner within the cobalt alloy wire for better visibility of accurate stent placement. Designed by using transradial approach, the Resolute Onyx offers 5 Fr catheter compatibility with stent sizes up to 5.0 mm. The new DES allows to provide more treatment options for patients with extra-large vessels, as it is available in 4.5mm and 5.0mm DES sizes. Resolute Onyx DES is also marketed in Europe and other countries that accept CE mark approval. Medtronic cardiac and vascular group’s coronary and renal denervation business general manager and vice president Jason Weidman said: “We set out to expand upon a proven DES technology to enhance clinical performance and deliver further meaningful innovations that address the needs of interventional cardiologists around the globe. Image: Medtronic’s Resolute Onyx DES with Core Wire technology. Photo: courtesy of Medtronic.